Sonix is an audio and video transcription solution that enables businesses to transcribe, organize and search video and audio files. The fully automated software is able to transcribe 30 minutes of audio or video in approximately 3-4 minutes, for industries that require quick and stress-free transcription services. As automated transcripts are not 100% accurate, Sonix allows the reviewing and editing of transcripts, with features including the online editor which allows users to polish a transcript while listening to the audio, and word confidence levels which highlight words that may need extra review due to low confidence during the transcription process. The user can also highlight and strikethrough the transcript to quickly find areas of focus later. 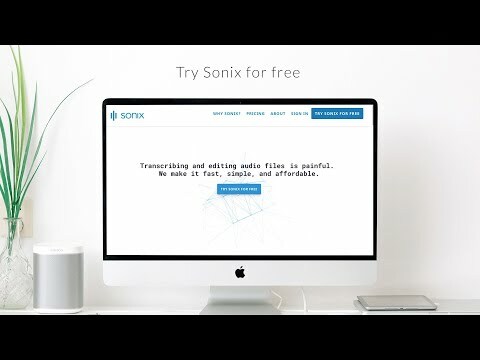 Sonix facilitates uploading and importing of videos and audio, with tools for allowing the user to drag and drop files from their local computer or have the software transcribe files stored on Google Drive and Dropbox. To aid with review, text and audio is synchronized to allow the user to click on any part of the transcript and play the audio from that exact moment. Every word within transcripts is automatically indexed so that the user can jump to the exact moment when something was said in the file. Users can also slow down or speed up playback to simplify and ease the editing process. The high confidence words are shown in black while the low ones are highlighted in orange, so that the user know where to focus their attention when editing. The user can download a section of the audio by selecting that area of text, and Sonix allows the export of transcripts into various formats such as Microsoft Word and text file. It was amazing how quickly and accurately the audio file was completed! Saves so much time and effort. I will have to work manually to edit but that's so much better than having to start from scratch.The speaker on the uploaded 15 minutes audio file sometimes garbled or slurred his words, and yet Sonix was able to complete a transcription that was 90 % accurate in only 3 min. The audio editor is remarkable - I've never seen anything like it. Each word in the transcription is highlighted perfectly in sync as the audio is played. You can click the mouse in between a few words before the current word and the audio will start again at that point. There is absolutely no lag time after clicking to start the audio playing again - it's immediate! I have produced transcriptions before using the MPC audio player positioned in a small rectangle of space on the bottom of my screen widened to fit the entire width of the screen to make it easier to move the pointer back a few seconds while checking the accuracy of the transcription using Word. I manually transcribed 6 hours of audio this way years ago. I think it took me 20-25 hours to do this. What a chore! Now there is Sonix that can transcribe audio in a fraction of the time, with 90+ percent accuracy. And it's so very much easier to just click a few words back to check accuracy, instead of trying to manipulate an audio pointer. PLUS - not only can I download a Word doc but also a .srt captions file that can be added to the original video to produce a captioned video from the same original transcription! This is the only way I will produce transcriptions from now on, saving so much time and effort! The speaker on the uploaded 15 minutes audio file sometimes garbled or slurred his words, and yet Sonix was able to complete a transcription that was 90 % accurate in only 3 min. The audio editor is remarkable - I've never seen anything like it. Each word in the transcription is highlighted perfectly in sync as the audio is played. You can click the mouse in between a few words before the current word and the audio will start again at that point. There is absolutely no lag time after clicking to start the audio playing again - it's immediate! I have produced transcriptions before using the MPC audio player positioned in a small rectangle of space on the bottom of my screen widened to fit the entire width of the screen to make it easier to move the pointer back a few seconds while checking the accuracy of the transcription using Word. I manually transcribed 6 hours of audio this way years ago. I think it took me 20-25 hours to do this. What a chore! Now there is Sonix that can transcribe audio in a fraction of the time, with 90+ percent accuracy. And it's so very much easier to just click a few words back to check accuracy, instead of trying to manipulate an audio pointer. PLUS - not only can I download a Word doc but also a .srt captions file that can be added to the original video to produce a captioned video from the same original transcription! This is the only way I will produce transcriptions from now on, saving so much time and effort! Overall, Sonix is the best way I know of to get my podcast out there for a wider audience. For the latest episode twice as many people read/listened to the episode using the Sonix player as downloaded and listened in a podcast app like Apple Podcasts. So we tripled our listeners to that episode thanks to Sonix.I love the embedded transcript / audio player. I use Sonix to transcribe podcast episodes and embed the transcript on my website. It's way better than a traditional transcription service because visitors to my site can click anywhere in the transcript to hear the audio at exactly that moment. I also get the benefit of the transcript being indexed by Google. I love the embedded transcript / audio player. I use Sonix to transcribe podcast episodes and embed the transcript on my website. It's way better than a traditional transcription service because visitors to my site can click anywhere in the transcript to hear the audio at exactly that moment. I also get the benefit of the transcript being indexed by Google. Currently they don't have an integrated human review/editing process. I use a contractor to clean up the transcripts because the AI isn't 100% perfect yet — no AI is at this point that I know of. So it takes a little more effort than a service such as Rev to get the transcript perfect. But the price ends up being the same or less, and the interactive transcript is something you just don't get with other services and makes it worth it. The recording, transcription and editing functions are really great. We used to get a lot of transcription done on Rev, but have switched almost 100% to Sonix. It takes a bit more time making corrections, but the experience is so easy that it's totally worth it.First off, the pricing can't be beat. For large volume transcription, Sonix is the best. The online editor is so easy and user friendly, by far the best I've used. The ability to download .srt files for all transcripts is a huge bonus. First off, the pricing can't be beat. For large volume transcription, Sonix is the best. The online editor is so easy and user friendly, by far the best I've used. The ability to download .srt files for all transcripts is a huge bonus. I wish Sonix's AI could learn from its mistakes. Over hundreds of transcripts, it still can not understand our organization's name. A user dictionary or something to correct commonly misunderstood words would be a huge benefit. The support from the Sonix team has been excellent with solving both technical questions related to the product as well as providing advice and payment options to suit my situation as an educator. Very impressive!The software is very intuitive to use and contains really helpful features like being able to review and correct details in the transcript while listening to the audio. This is the first software I have used that recognises and differentiates between multiple voices with a functional level of accuracy. The software is very intuitive to use and contains really helpful features like being able to review and correct details in the transcript while listening to the audio. This is the first software I have used that recognises and differentiates between multiple voices with a functional level of accuracy. This hardly seems like a disadvantage however, there is an investment of time required in reviewing and correcting 'misinterpretations' of words and phrases in the produced transcript. You also need to manually give an identity to the speaker of each transcribed passage of text though this takes a fraction of the time and cost expended on manual transcription. Pro (single user) - $11.25/month when billed annually or $15/month when billed monthly. Plus $6/recorded hour for transcriptions. Business (multi-user) - $16.50/user/month when billed annually or $22/user/month when billed monthly. Plus $5/recorded hour for transcriptions. Enterprise - $49.50/user/month when billed annually or $66/user/month when billed monthly. Plus special transcription rates. Contact the Sonix sales team for more information. Sonix highlights words to identify accuracy confidence. This makes it easy for users to fix the mistakes. Sonix has multi-user capability so that users can share and invite other team members to edit the same transcript. Users can edit pieces of text after transcription with the in-browser word processor tool. As Sonix is an web-based platform, it can convert an audio or video file into an online transcript in minutes. Sonix allows users to search the entire archive of transcripts to find a specific word or phrase from an audio or video file. Below are some frequently asked questions for Sonix. Q. What type of pricing plans does Sonix offer? Q. Who are the typical users of Sonix? Q. What languages does Sonix support? Q. Does Sonix support mobile devices? Q. Does Sonix offer an API? Yes, Sonix has an API available for use. Q. What other apps does Sonix integrate with? Q. What level of support does Sonix offer?